It’s time for you to accelerate in your career! So pumped to annouce to you the Prepare to Win Workshop Series – How to Win at Work presented by The Moses Group. 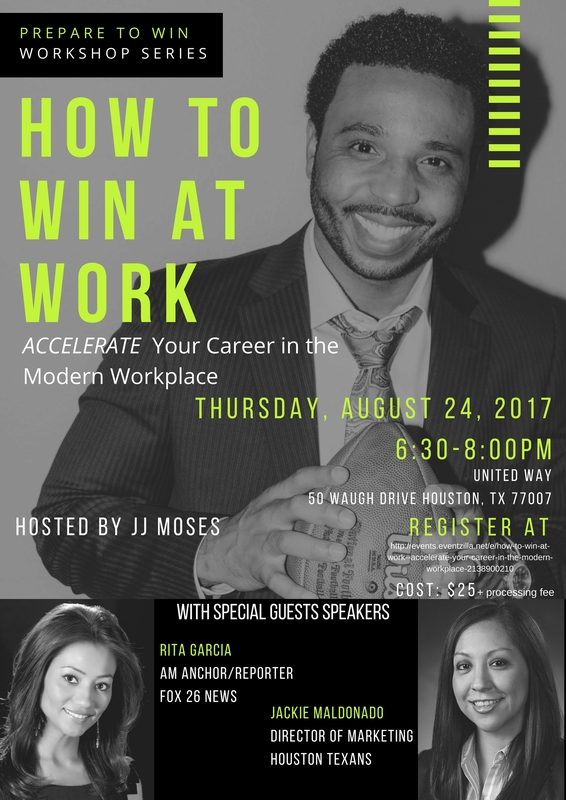 Make plans to join us on August 24 for this high-powered, motivational, and networking event with special guest speakers Rita Garcia (FOX26 NEWS) and Jackie Maldonado (HOUSTON TEXANS), two of Houston’s most influential leaders. In case you missed it, hear are the last few quarterback reports from KSBJ. Don’t Give Up, The Likability Factor, Shaking Off What’s Holding You Back and Let the Game Come to You. Even if you hear “no” for an answer, lose your job, or are facing a tough decision – don’t give up!